The Rider of the motorcycle in the pictures has been literally ripped in half. 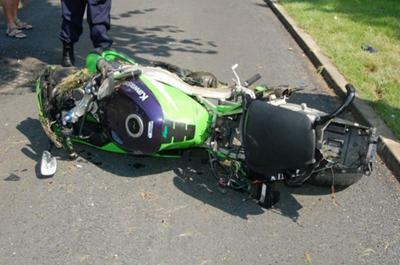 The Kawasaki motorcycle that the unfortunate accident victim was riding at the time of impact. 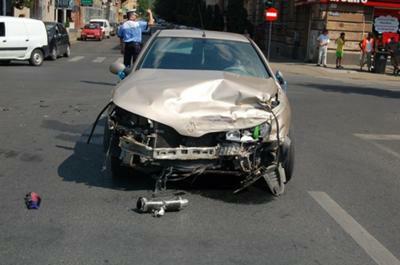 Picture of the damage to the front end of the car. These EXTREMELY Gruesome Motorcycle Accident Photos do a pretty good job of showing what can happen when a bike hits a car moving at a fast rate of speed. The facts of the motorcycle wreck are not clear other than it was said that either the motorcycle or the automobile was going at least 200km/h. For that matter after studying the pictures carefully, I've been unable to determine whether the rider of the bike was a man or a woman although I'm leaning toward saying the victim was male judging by the size and muscled appearance of the arm that the worker is holding. 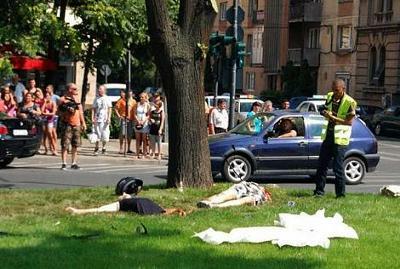 I'm not whether both or just one of the cars was moving that fast or which of them instigated the crash. Did the motorcycle or the driver of the car run a stop sign and get hit in the side? Did the driver of the motorcycle cross over the center line and hit the car head on? From the off center damage to the front of the automobile it could have been the latter but I'm not an expert on accident forensics. What truly boggles my mind is how the bystanders were able to just stand idly by and avoid being sick while the crew worked to remove body parts and gore. That they stuck around after the wreck is pretty amazing. The purpose of sharing these horrible, sickening motorcycle wreck pictures is not for the shock value but to warn people to be aware and to watch both their speed and the speed and reckless driving habits of others. Motorcycle riders MUST practive more than their share of defensive driving because the majority of four wheel drivers don't watch as closely as they should for two and/or three-wheel vehicles. If they aren't texting and talking on their cellphones weaving all over the road, they are cutting motorcycles off or pulling out in front of them after giving little more than a glance to oncoming traffic. 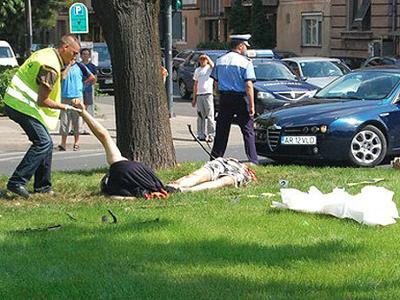 Are these extremely gruesome motorcycle accident photos real or fake? Who knows; call in an expert on photo editing and get them to check them out and let me know. But one thing that is very, very REAL is the danger that careless drivers in cars present to motorcyclists as well as themselves each and every day! How about warning riders of these little rice burners not to act like entitled dumbasses? Teens that ride Kawasakis and Yamahas ride so fast and in a split secound they can hit a car. I feel for these people but they don't care. A motorcycle CAN take you "out of this world" but as these pictures indicate, not necessarily in a good way. Be careful, bikers, and watch out for the other guy; they don't always watch out for us. Join in and write your own page! It's easy to do. How? Simply click here to return to Motorcycle Wreck Pictures.